Update: This post has been edited on February 18, 2019, to reflect the latest WordPress best practices. WordPress is THE BEST platform for any and all serious bloggers. Period. So, in this blog post, I’ve decided to give you a run-down on why I believe you should choose self-hosted WordPress as your blogging platform from the get-go, and exactly how you should set up your very first blog. Speaking of self-hosted, I’ll also talk briefly about what it means to have a self-hosted WordPress blog/website. This seems to confuse a lot of people, so spending a few minutes to shed light on this topic seems reasonable. Why is WordPress the Best Platform for Serious Bloggers? But first, who is a serious blogger? What blogging platforms are out there and why the stress on WordPress? But, What the heck is a self-hosted WordPress? How to Determine Which Hosting Company to Go With? How to Set Up Your Self-Hosted WordPress Blog? Instead, they treat blogging as they treat their jobs. You won’t show up for work only when the mood strikes, do you? Chances are, that kind of behavior will get you fired. Even if you do not have a traditional 9-5 job, instead, if you have your own business and/or you’re a freelancer, then you know how important it is to set up a schedule if you wish to get anything done or maintain a good relationship with clients. Serious bloggers also know how to turn the most boring of situations into blog posts that readers will lap up. Take the above situation for example where our imaginary blogger goes on a trip to the Key West with the neighbors and their screaming, yelling, pooping toddler. Instead of treating their blog as an outlet for whining, they turn their experiences into meaningful blog posts such as “15 Toddler-Friendly Ways to Spend a Magical Weekend in the Key West”. Serious bloggers understand that taking this blogging thing lightly is not an option. In order to succeed in this business, you need to work hard, be disciplined, continuously strategize, and be ruthless. Blogging ain’t easy and serious bloggers internalize this fact from the get-go. If they want to make money off of blogging, they know that they have to give it their 120%. Truth be told, there are a lot of platforms you can use for blogging, including some free platforms. But what I’ve found over the years in my capacity as a web designer and developer who’s worked with a lot of bloggers, is that all these platforms come with their own sets of limitations. Blogging, taken seriously, can often reach a point when one needs to set up many complex systems within their blog. Other than a self-hosted WordPress platform, ALL OTHER platforms will present you with SERIOUS limitations when you venture out of “hobby-blogging”. The cool thing about self-hosted WordPress is that it’s open source and you can do practically anything you can think of! There are absolutely no limitations. You can set up multiple payment gateways, you can set up as many email opt-ins as you want with as many different sources as you want. You can customize your blog posts to appear in certain ways that fit your needs, you can hide some categories, show the others, you can customize your affiliate links right from your dashboard, change them with just a click across your entire website… to name just a few things you may find yourself doing as a serious blogger. WordPress also comes with nifty little pieces of software called plugins and really, if you can think of a feature or functionality, you bet someone has already created a plugin for that. This makes WordPress extremely versatile and powerful. You see, WordPress has two versions. One if self-hosted (often referred to as the .org version), and the other is not self-hosted (often referred to as the .com version). The self-hosted (.org) version is the one you should be using as a serious blogger. That’s the version that’s most powerful, most versatile, and above all, with self-hosted WordPress, as the term suggests, you own your blog/website. This means that you purchase hosting with a company where you can install WordPress. And because you own them, all the pieces of the software is available to you. You can tweak them, edit them, do whatever you want with them. If you’re a serious blogger, it’s best that you start your blogging journey in your own platform — which is the self-hosted WordPress platform. Being self-hosted means you will need to purchase hosting space. There are companies who have already set up servers all around the world, so the best way to get hosting is to purchase hosting from one of these companies. Now, there are a lot of hosting companies, so how do you know which hosting company to go with? That’s where you will need to do some research. Find out which hosting companies have been around for a while. See if they offer SSL (Security Socket Layer), find out if they have tight security in place (you don’t want to get hacked every other day), see if a company takes measures to decrease load time/improve website speed. After you have done your research, make a calculated decision as to which of these companies will be best for you. There are all sorts of hosting options out there, and each of these platforms caters to a different level of users. Depending on how big your blog is, how much traffic you get, what sort of functionalities you have in place, your technical know-how, you will have to choose the right hosting option. With that said, I personally have my preferences. 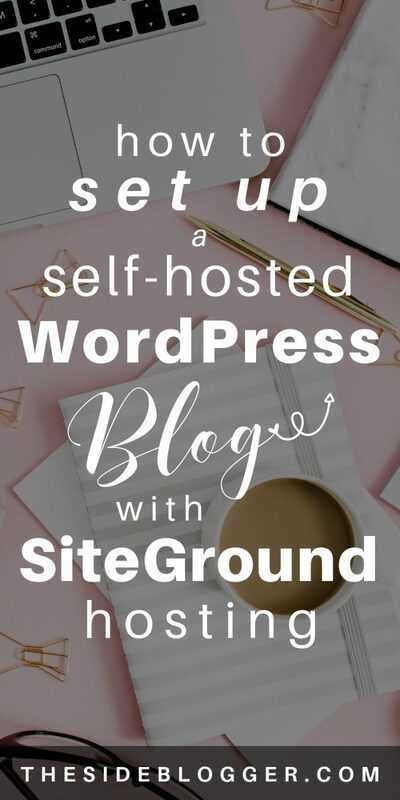 Over here, The Side Blogger is hosted by one of my favorite hosting companies, and in this blog post, I’ll show you how to set up your blog using the very same hosting company — SiteGround [affiliate]. SiteGround packages start at $3.95 for first-time users, offers FREE SSL (Security Socket Layer), has daily backups, unlimited email addresses, they’re faster than most other hosting companies in the same price range, and also more secure. But above all, they have phenomenal 24/7 customer service via phone and live chat. If you want to learn more about them, I have a blog post on this topic: 10 reasons why I started my blog on SiteGround and you should too. Now that you know all the basics of starting a blog, let’s go over the step-by-step procedures for setting up your self-hosted WordPress blog. Of course, the very first things to do would be to purchase a domain and hosting. You can have both the domain and hosting from the same company, but if you’re like me, and are just a little paranoid about site security, you’ll choose to buy your domain and your hosting from two separate companies. And as for hosting, as I said, I recommend SiteGround because of the reasons mentioned in the previous section. Getting your hosting with SiteGround is really simple. Go to SiteGround [affiliate link]. Scroll down until you see the different hosting plans, and choose the first one — “Web Hosting” (image 1). Now, as a beginner, I strongly recommend choosing the GrowBig plan over the StartUp plan because it comes with a couple great premium features: free backup restore (in case something goes wrong during a plugin update, you can restore your site to a previous version with a click, completely free of charge), and SuperCacher — which boosts your site speed considerably. So, unless you’re really tight with your budget, do please choose the GrowBig plan (image 2). Image 1: Choose “web Hosting” — the first option. After you choose your plan, in the next page you’ll be asked to either enter a domain you already own or register a new domain. Fill out the information as they pertain to you (image 3). If you’re registering your domain from SiteGround, you’ll have the option to choose domain privacy as you scroll down the page. I highly recommend choosing domain privacy or your information is open to the public (image 4). The other option you have is the SG Site Scanner. It is also a nice thing to have, however, starting out, if you’re on a budget, you can leave it out for the time being and use a really nice plugin called WordFence (more on WordFence below). Enter your payment information and make the purchase. Image 3: Either enter a domain you already own from a third party, or register a new domain with SiteGround. Image 4: Choose your hosting period, and any other optional services you wish to add. If you’ve decided to purchase both the domain and hosting from the same company, then you can skip this section. However, if you’ve purchased them from different companies, as I recommend you do to add an extra layer of security, then you will need to point your domain to your hosting company so that a computer knows to look for the website associated to the domain address on the hosting provider’s server. Pointing a domain to a different hosting company is fairly straightforward, and in most cases, it’s done by changing the nameservers of the domain. A detailed set of instructions on how to point your domain can be found in this blog post: How to Point Your Domain to WordPress Website Hosted by SiteGround. Yes, the method outlined is for domains and hosting purchased from Namecheap and SiteGround respectively, but all companies have more or less similar back-end interfaces. So, no matter where you’ve purchased your domain and hosting from, you should be able to put two and two together. And now I’ll show you how to install WordPress via cPanel of your hosting provider. As previously mentioned, there are a ton of hosting companies out there. However, since I recommend using SiteGround, I will show you how to install WordPress on SiteGround. I find that installing SSL BEFORE I install WordPress is often better than doing it afterward. Not that you can’t (so if you have forgotten to install SSL and have gone ahead and installed WordPress first, it’s OK. No need to panic! ), it’s simply the order I prefer. After logging on to SiteGround, go to My Account > Go to cPanel, then locate the “SECURITY” panel, and click on “Let’s Encrypt” (image 5). In the next page, scroll down to where it says “Install new Let’s Encrypt Certificate”. Choose the correct domain from the drop-down (if you have multiple domains), and then choose either Let’s Encrypt SSL, or Let’s Encrypt Wildcard SSL. If you have or plan to have multiple WordPress installations on multiple subdomains, then you’ll want to choose the Wildcard SSL, otherwise, the standard Let’s Encrypt SSL will suffice. Click on “Install”, and wait until it finishes the installation (image 6). When it’s done, you should see a success message. Now, go back to the cPanel, locate “WORDPRESS TOOLS” panel, and click on “WordPress Installer” (image 7). In this page, click on the blue tab that says “Install”. Make sure to choose https:// in the protocol, and then choose the right domain (image 8). Typically, the directory field is left empty unless you want to install WordPress in a separate directory. Scroll down and pick a name and description for your site. These fields can easily be changed afterward, so don’t sweat it too much. Scroll down further, and change the Admin Username and Admin Passwords. The default is usually some random letters and characters. make sure you choose a username that’s difficult to predict, and a strong password that has capital letter(s), small letter(s), and special characters. Make sure the Admin email address is a good email address that you check regularly (image 9). Where it says “Choose a theme to Install”, you can leave it set to none for the time being. This falls back on default and a generic theme is installed, usually some version of twenty-something. You can pick a different theme afterward, so don’t sweat it for now. Scroll all the down and click “Install” to install WordPress. This should take a few seconds to a minute, and when the installation is complete, it will show you a success message and a link to your WordPress dashboard. Typically this is something like https://mywebsite.com/wp-login.php. Go to your WordPress dashboard (you will need to use the username and password you picked to log in) and make sure it’s working. Back in the days, WordPress installation came with a bunch of pre-installed, unnecessary plugins. Thankfully, SiteGround at least has gotten rid of most of them. The only pre-installed plugin now is the SiteGround Optimizer plugin, and after careful consideration, I’ve decided that it’s OK to keep it because it allows you to optimize your WordPress blog which helps site performance. WordPress also comes with a few themes that are pre-installed. Now, you don’t really need them, and I suggest getting rid of all themes that are not in use right away. Now it’s time to install a template. A template determines how your blog/website looks and performs. It’s imperative that you choose a good theme, that’s well coded, and from a reputable theme-foundry who won’t disappear on you in two years. There is no shortage of free and paid, premium templates for WordPress. There are also site-builder plugins. However, for a total beginner, I suggest premium templates from a reputable theme foundry. Personally, I love themes from StudioPress [affiliate]. They’re built using the Genesis [affiliate] framework, which is a solid framework. Also, Restored 316 is a great theme foundry that uses the Genesis framework (like the StudioPress themes) and it has a lot of great quality, feminine themes if you’re into that. Another theme-foundry, also based on the Genesis framework, is Hello You Designs. If you’re feeling a bit more adventurous, and you want to enjoy creating unique pages that look more like a professional business website more so than a blog, then I’ll suggest going with my favorite drag-and-drop page builder plugin Elementor [affiliate] paired with the free Astra or GeneratePress themes. In fact, this very blog is made with the Elementor + Astra duo. To install a theme, go to Dashboard > Appearance > Themes, and then click on “Add New”. Follow the prompts to install the theme of choice, and then click on “Activate”. Most themes will require you to do some initial setup, and you can do that by following their support documentation (another reason to choose a good theme with good documentation). Anti-Spam – for detecting and filtering spam comments. WordFence Security – for securing your website from brute-force attacks and malware. WP Smush – for optimizing and compressing image files. Sassy Social Share – for sharing blog posts. Contact Form 7 – for embedding forms. WP Super Cache – caching plugin to make your site load faster. Media Cleaner – helps you clean up unlinked media files in your media library. WP-Optimize – gets rid of unnecessary things such as revisions that are automatically saved, pingbacks, trackbacks, etc. to improve site speed and performance. Also, since Gutenberg was released, I’ve been using a plugin called Classic Editor. Classic Editor replaces the Gutenburg editor and instead used the previous editor which I prefer much more over the Gutenberg editor. I feel that the Gutenberg editor is still not very user-friendly when it comes to bloggers. I don’t know about you, but I tend to write long-form blog posts, and I also craft all my blog posts directly on the WordPress post editor. The Gutenberg editor is really not meant for crafting long-form content on the editor itself. Feel free to play with both editing platforms and see which you prefer. 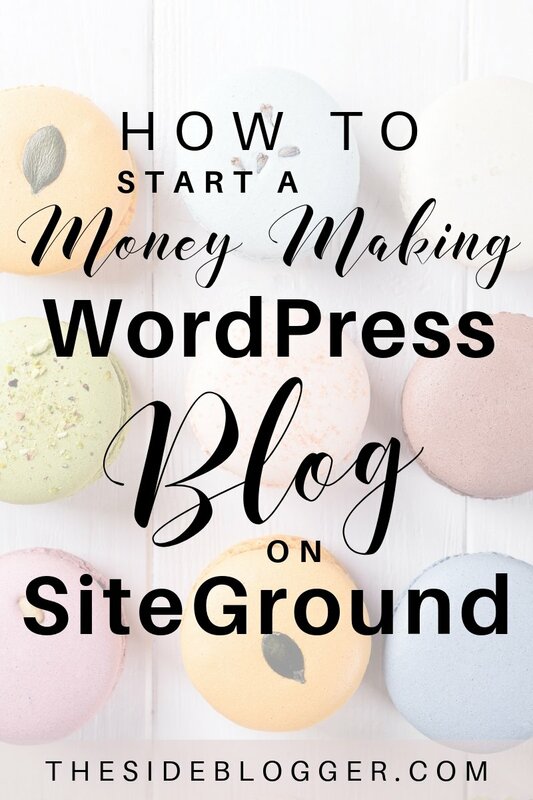 Step 6 takes care of the technical aspect of setting up your WordPress blog with SiteGround [affiliate]. But do keep on mind that setting up the blog is only the first step. The actual work starts AFTER you’ve taken care of the technical bits. There are a whole bunch of things to learn, such as starting and growing an email list, doing SEO, social media marketing, promoting, getting traffic, selling, making money, etc. However, my advice to you is that you start by focusing on the fundamentals. Writing. Yes, blogging is all about writing, writing in a way that makes it impossible for your ideal audience to pass you by. You want to write to entice readers, convert them into loyal readers, readers who’ll keep coming back to your blog, buy from you, stick by you, etc. And that means writing consistently and writing about things that your readers will benefit from. Do keep in mind that the blog isn’t just about you; it’s also about your readers. In fact, it’s mostly about your readers. Start there, start with prioritizing your audience, and by making sure you’re providing value with each blog post. The rest will follow. If you’re unclear about any of the steps above, or if you have questions and/or comments, leave them in the comments below! I’ll try to address as many of them as possible, as soon as I can. Thank you for reading! I discovered you recently and I must say you are such an inspiration! Thank you so much, Corina. Hope you find this blog useful!